In recent blogs we’ve brought you the lowdown on the most recent hypercar Holy Trinity, a 1960s Classic Trinity and, to complete a trinity of Trinities, another from the 2000s. The nine cars featured in those were an Aston Martin, Jaguar, McLaren, Mercedes-McLaren, two Porsches and three Ferraris – all names with decades of history and achievement behind them. The alternative trinity here, all from the mid noughties, is comprised of one illustrious marque that dates back to 1909 which is now part of a global giant, along with two newcomers that effectively sprang from nowhere during the 1990s. All three were very soon challenging and even surpassing the established supercar benchmarks. Bugatti, along with Audi, Bentley, Lamborghini and others is of course part of the VW empire. With a correspondingly enormous development budget and the not inconsequential matter of 1,000 odd horsepower, the Veyron could hardly fail to cause a major stir. Like the Veyron, Koenigsegg and Pagani cars were also the realisation of one man’s dream, although designed and produced by much smaller concerns. Some predicted Koenigsegg and Pagani would soon flounder and quietly disappear. And that Bugatti might too. But they didn’t. Far from it. Bugatti is undoubtedly one of the most evocative names in automotive history. One reason for this is that its racing cars were terrifically successful in pre-war times. The first ever Bugatti racer won the first Grand Prix it entered in 1924, while other major successes included victory in the first ever Monaco GP, two victories in the Le Mans 24hr race and five successive wins in the Targa Florio. Another reason is that Bugatti road cars were both beautiful and reassuringly expensive. And so the legend was born, only for the firm to grind to a halt in the early 1950s. Skip forward three decades and the mysteriously-financed Bugatti Automobili was formed in 1987. Four years later the EB110 was launched and with a 3.5-litre quad-turbo 560bhp V12 (or 603bhp in ‘GT’ spec) it was a worthy competitor to Ferrari and Lamborghini – worthy enough to be well received in the press and for Michael Schumacher to buy one. But despite this, the Italian operation went bust in 1995. The Bugatti brand was acquired by Volkswagen in 1998 (as was Bentley and Lamborghini). Now called Bugatti Automobiles S.A.S. and based in Molsheim, France, the first Veyron concept (named in memory of Pierre Veyron who won the ’39 Le Mans 24hr driving a Bugatti) was revealed at the 2000 Paris show. Following an extended development period due to high speed stability and engine cooling issues, the production Veyron 16.4 finally hit the streets in late 2005 – a good two years later than planned. Those technical issues weren’t an easy fix. With eight litres and four turbos engineers were having difficulty in dispersing the immense heat generated by the 16 cylinders without resorting to carving out big vent holes in the Veyron’s fastidiously preened bodywork. Hole cutting can be an effective solution on racing cars, but it wasn’t an option for the €1.2m designer Bugatti and so by the time it hit the streets it was equipped with no less than 10 radiators. The other issue was that when test drivers approached the Veyron’s top speed the car began lifting, with a consequent vagueness to the steering. Racing car aerodynamicists can tack on all manner of paraphernalia to alleviate such issues, but that would’ve been tantamount wrapping your Rolex in a polythene bag before taking a dip in the pool. So, more subtle solutions had to be found, and they were, eg. the Veyron’s active aero and auto hydraulic ride height adjustment. Somewhat surprisingly, at the time the Veyron was neither the most expensive nor the most powerful new car to come to market. Those accolades went to the late ‘90s Mercedes-Benz CLK-GTR which in the UK retailed at about £1.2m, while the small US maker SSC claimed 1,046bhp for its Ultimate Aero hypercar. 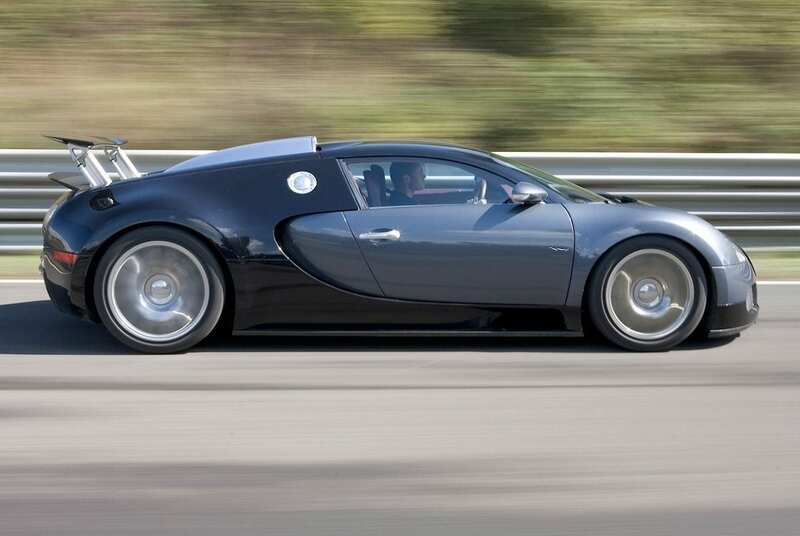 The Veyron did prove however to be the fastest. In May 2005 at VW’s Ehra proving ground in Germany it was independently timed at 248.5mph, a speed achieved several times in both directions. This beat the Koenigsegg CCR’s 241mph world record set three months earlier, and the McLaren F1’s 240.3mph set in 1993. Furthermore, Bugatti soon quoted an officially verified 253mph max (electronically limited for tyre safety) and, despite its near 2-tonne weight, it accelerated from zero to 200mph in the same it took the 1,200kg McLaren F1 to accelerate from 135mph to 200. Then in 2006 an SSC Ultimate Aero was officially timed at 256.14mph, and so in 2010 came the Veyron 16.4 Super Sport. With 1,183bhp the Super Sport was limited to 258mph, but de-limited it retook the road car record with an officially verified two-way average of 267.856mph. Bugatti produced other Veyron variants; the convertible Grand Sport and Grand Sport Vitesse, while limited editions included the Super Sport World Record Edition and the Pur Sang. Additionally over a dozen one-offs were built, some dedicated to various legendary pre-war racing drivers and Bugatti heroes, while others included the ‘L’Or Blanc’ which was partly finished in fine porcelain, and the ‘Lang Lang’ built for a Chinese concert pianist and inspired by a piano keyboard. Prices of these one-offs were in the €1.6 to €2 million bracket. Early deliveries of the Veyron’s replacement, the 1,479bhp €2.4m Chiron, commenced in 2016, and word is that potential customers were acquiring used Veyrons simply to get themselves on Bugatti’s Chiron list. In February 2005 a small team from Sweden gathered at the Nardo proving ground in southern Italy armed with a Koenigsegg CCR. Their mission was to break the production road car speed record, which at the time was held by the McLaren F1 at 240.3mph. In theory, and assuming similar aerodynamics, the CCR’s 806bhp should have whipped the McLaren’s 627bhp, but things are rarely that simple. One handicap for the Swedes was that the McLaren’s record was achieved at VW’s Ehra proving ground in Germany which features a 5.6 mile straight. Conversely, the Nardo track is a 7.8 mile circle which means that the car is constantly turning, and the friction caused by high speed turning saps precious horsepower and scrubs speed. The CCR accelerated onto the track and recorded 241.02mph. Although only 0.72mph faster than the McLaren, it was enough to take the record. The Koenigsegg crew drew further comfort from the fact that when the McLaren F1 had visited Nardo it recorded 231.2mph, while a Ferrari Enzo had only managed only 220.6mph (3.1mph faster than its quoted max…). But, as the saying goes; it’s tough at the top. Just three months later Bugatti showed up at Ehra and took the Veyron to 248.5mph. However you look at it, the Koenigsegg CCR was certainly fast, but what is a Koenigsegg? Inventor, designer, engineer, entrepreneur and all-round genius Christian von Koenigsegg’s supercar project started in 1994. A working prototype was built by the end of the following year, and much of 1996 was spent testing and developing on the track and road and in Volvo’s wind tunnel. In 1997 a second prototype (the CC) was revealed, and in 1998 the car underwent tests for international certifications. The first production prototype was assembled and tested during 2000 and was subsequently premiered at that year’s Paris Motor Show. In 2001 the world’s press awarded the CC 8S critical acclaim and the first customer took delivery in 2002. In 2003 the CC 8S was further improved, and with 655bhp from its home-spun 4.7-litre supercharged 32 valve, quad cam V8 it could accelerate from 0-62mph in under 3.5 secs, cover the standing quarter in 10 secs and “exceed 230mph”. In 2004 all development effort was concentrated on the new CCR model. The CCR’s V8 had dual superchargers running at higher boost and power rose to 806bhp. The CCR’s quoted figures were 0-62mph in 3.2 secs, the standing quarter in 9.0 secs, and that world record 241mph top speed. Then, at Geneva in 2006, Koenigsegg showed off the all-new CCX. Though no more powerful or any faster than the CCR, the subtly redesigned CCX complied with stringent US crash test regulations. The CCX was also slightly longer and had increased downforce along with optional ceramic discs and carbon fiber wheels, better cabin ventilation, 50mm more headroom and comfier seats. There then followed about five different CCX-based models, a solar powered 4-seater concept called the Quant, the 1,340bhp, 274mph One:1 and four different Ageras including the current 1,160bhp Agera RS which, like some previous Koenigseggs, can be run on biofuel for even greater power. The other current model is the more luxurious petrol/electric hybrid Regera. With a single-speed ‘Direct Drive’ transmission and some 1,489bhp the Regera is currently the world’s most powerful production car. How fast? 0-62mph in 2.7secs and 0-250mph in 20. Top speed is limited to 255mph. Despite so many models, production numbers are small. 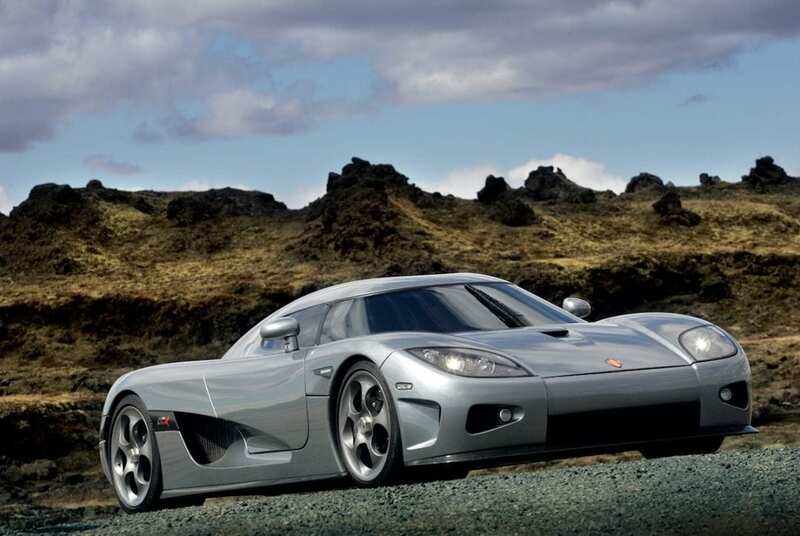 The most popular Koenigsegg to date was the CCX of which just 29 were built from 2006-2010. Twenty-five 270mph Agera RS are planned along with no less than 80 Regeras, so the firm’s future looks assured at least for the foreseeable future. Huge power and a fistful of speed records aside… Back in the ‘90s von Koenigsegg wanted a unique door hinge mechanism for his new car. Having approached several specialist designers who all declared that what he required was impossible, he set about designing it himself. The result of his efforts made it to production and his Dihedral Synchrohelix system employs two parallel arms that rotate on a geared pivot which allow the doors to open in a graceful outward arc. More recently he’s developed the Autoskin system for the Regera – ‘the first car in the world that operates all body closures completely automatically, at the touch of a button’. It all works beautifully, and fine points such as these say as much about the integrity of von Koenigsegg’s cars as anything else. Following many design collaborations with Lamborghini during the 1980s and a lifetime of dreaming, Argentinian Horacio Pagani decided to produce his own supercar in 1988. Having made acquaintance back in Argentina with fellow countryman and five-time Grand Prix World Champion Juan Manuel Fangio, the legendary driver lent Pagani moral support and, by using his still considerable influence at Mercedes HQ in Stuttgart, Fangio was instrumental in persuading Mercedes to supply Pagani with V12 Benz power for his project. Drawing inspiration for the basic shape from the Mercedes-powered Sauber Racing Group C Le Mans endurance racers, 25,000 hours were spent conceiving the concept, style and virtually every engineering aspect of the new car. In 1992 Pagani founded his business near Modena, and built a prototype that was wind tunnel tested the following year. But the Zonda had real substance too. With a 6-litre 420bhp Merc V12, the C12 had a power to weight ratio of 336bhp per tonne. It could hit 60mph in 4.5 seconds and nudge 200mph, all for the princely sum of 480 million Italian Liras. Then in 2002, and as though close neighbors Ferrari and Lamborghini hadn’t already taken notice, Pagani launched the Zonda C12S. With a few aerodynamic and styling tweaks, plus a 7.3-litre V12 making 555bhp, the C12S boasted 444bhp per tonne. Performance consequently improved further with 0-60 in 4.0 secs and a top speed close to 210mph. The price went up too, rising from around £195,000 (C12) to around £300,000 (C12S) in the UK. Then sure as night turns to day at Geneva in 2005 Pagani revealed the still faster Zonda F. Although the F’s engine was no bigger than that in the S, the higher revving motor packed a bigger punch. Power rose to 602bhp, and with optional carbon ceramic brakes fitted, the F was 30kgs lighter than both the C12 and C12S. This meant 489bhp per tonne, which in turn meant a 3.6 sec 0-60mph time and a 214+mph max. 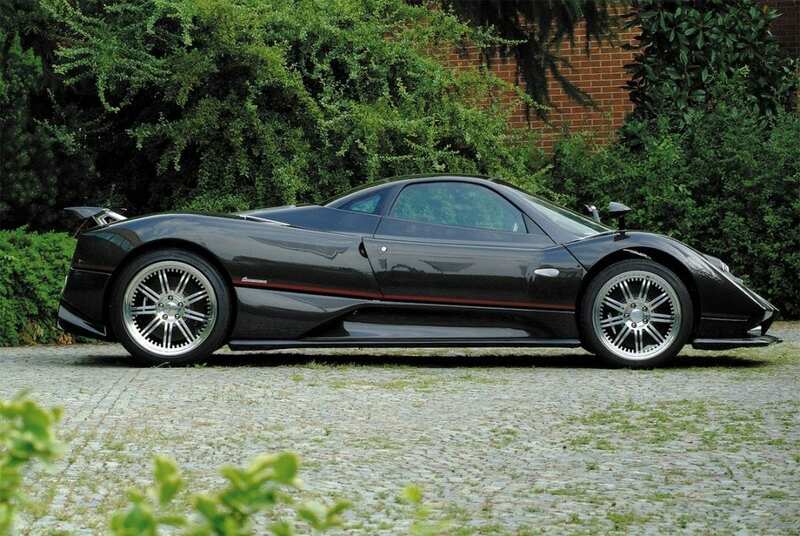 There was also the option of the 650bhp Club Sport engine, and with 528bhp per tonne the Zonda F CS was on a par with the mighty Bugatti Veyron. It could also brake from 124mph to a dead halt in just 4.4 seconds and the F could generate 1.4 lateral g in corners – then the highest figure for any street-legal road car. Pagani also produced a Roadster version, which in 2006 would’ve set you back £825,000, but Zonda production figures aren’t easy to ascertain. Guesstimates are that the small factory turned out approximately five C12s, 16 C12Ss, about 40 C12S 7.3s and maybe 50 Zonda Fs (hardtop and Roadster). Then there were five F Cinques, about eight other special editions plus at least half a dozen in the Zonda 760 One-off Series, including the 750LH built for Lewis Hamilton. Zonda production ended in 2011, the same year that the turbocharged Huayra replacement was launched. Initially priced at £820k, a hike in March 2013 took its UK price to over £1m. Meanwhile, all 20 of the 789bhp, €2.3m Huayra BCs were sold before anyone outside Pagani’s inner circle had even seen one. The Pagani brand may lack the provenance of the old school marques, but when the product is as exquisite in every detail and the cars are in such demand, that’s not something Mr. Pagani is going to lose sleep over. This completes our second Trinity of the 2000s – a decade in which barely a month went by without another exotic supercar being announced. Some were from long established makers like Ford (GT), Lamborghini (Murciélago) and TVR (Cerbera Speed 12), while others such as Ascari, Gumpert, Hennessey, Mosler, Saleen, Spyker, SSC and Ultima all wheeled out their contenders. And then there was a string of other ambitious hopefuls all hoping for a small slice of the rich supercar cake, but failing to get a taste. We probably shan’t be bringing you stories on all those, but we do have further plans… Meanwhile we’ve created bespoke finance solutions for cars of this calibre for numerous clients. To discuss how we might help you own the car of your dreams, call one of our experts today on 020 3355 0035. See below for our ‘Top Trumps’ style stats on these models, with thanks to Tommy Wareham at Supervettura for insight on the current values of these cars.